A childhood love of flowers has taken photographer and author Sue Bishop on adventures around the world, from Tuscany to Texas, always seeking out the most colourful, beautiful, flower-filled landscapes to photograph. It’s mainly the landscapes of the UK and Europe that she spends time photographing, and these are where she holds many workshops and tours. 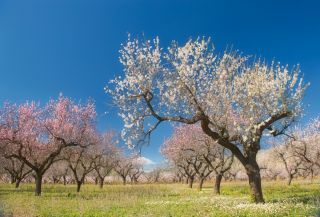 These include almond blossoms in Spain, tulips in Holland, wildflowers in Switzerland and the lavender farms of the Cotswolds. Whether working on an exquisite close-up or a wide-open landscape, she aims not to just record a flower or landscape, but to create a work of photographic art. Here, she talks to Graeme Green about her favourite flower locations, her approach to composition and her tips for capturing flowers at their best. GG: What got you started in flower photography? SB: Right from the beginning, I mainly photographed natural subjects, and I quickly became drawn to flowers because of their beautiful colours and graceful shapes. They are fragile and ephemeral, and their perfection may only last a day, so there is something wonderful about trying to preserve it in an image. Also, I quickly developed a love for macro photography, and flowers and plants are ideal subjects for macro. How do you approach working on a close-up of a flower? What are your main considerations for composition? Once I’ve identified a flower that I think is in lovely condition, and also has good background possibilities, I tend to look through the camera while moving around my subject. I move at close distances, as every small move you make will make a big difference to the composition, the point of focus and background. The background is as important as the subject, so as well as concentrating on the main flower and its position in the frame, I always try to achieve a good balance of colours and shapes thrown out of focus in the background. What’s the difference between just a photographic record of a flower and a piece of photographic art? The answer to this could take up a whole book. In short, with today’s excellent cameras, it’s very easy to take a good record picture of a flower, which is properly exposed, sharply focused and so on. To turn it into something more, the photographer needs to put something personal into it, a different way of portraying it by their choice of viewpoint, depth of field, angle of light or other elements. The background is as important as the subject. A botanical record photograph would be one that shows the plant’s flower, leaves and stem in sharp detail. An art photograph is trying to show the photographer’s emotional response to the flower, and that conveys the sense of beauty and wonder that he or she experienced while looking at it. What kind of gear, lenses and lighting do you use for close-ups? I use a Nikon D800 with a very old AF-S Micro-NIKKOR 105mm f/2.8 lens, so old that it doesn’t have VR. I also use a tripod wherever possible, not because I’m worried about camera shake, but so that I can really fine tune the composition and focus exactly where I want to. I tend to photograph at wide apertures so that depth of field is very shallow, and a very small movement would be enough to lose my point of focus if I was hand-holding. I always use natural light, never flash. I always use natural light, never flash. On a sunny day, I use a reflector to bounce light back into the shadowed areas, and if the sun is really harsh, I will sometimes use a diffuser. I almost always work outdoors, but occasionally I will photograph inside using window light and a reflector. How do you work when you’re photographing wider landscapes? How long do you spend exploring a place or location? When I arrive at a new location, I like to spend a little time exploring it before I get my camera out. However, this goes by the board if the light is lovely and then I want to start working straight away. I love being out at sunrise and sunset, and also the blue hour before the sun rises and after it sets. I especially enjoy landscapes with water in them, and I love doing seascapes and playing with long exposures. How do you produce a creative landscape photo, rather than just a photo of a field of flowers? What are you thinking about in terms of composition? Looking at a field of lovely flowers, it’s easy to imagine that all you have to do is press the shutter button and you will have a beautiful image. But, like everything else, it’s not that easy. I remember photographing a huge and completely flat field of wildflowers in Texas. On all four sides of the field were streets with cars and houses, so an overview wasn’t possible. There was nothing in the field to use as a focal point, such as a tree, so I decided to use a 300mm lens and make pattern pictures, looking for areas where there was an interesting distribution of the different colours. At other locations in Texas I would make use of a rustic fence running through the flowers, or, best of all, a tree. In bluebell woods, it’s important to think about the arrangement of the tree trunks within the frame, as well as the bluebells themselves. Similarly, with orchards of blossom trees, where the trunks can sometimes make a pleasing pattern, sometimes I’ll use a multiple exposure, with one sharp and one defocused, to add a bit of softness to the image. Do you think the UK has some of the most photogenic flowers and flower landscapes in the world? Yes. I especially love bluebells, which are quintessentially British, growing in beech woods, as the beech trees have such clean, straight trunks. In June, the wildflowers in the Yorkshire Dales look spectacular in bright swathes against the dry stone walls. The Cornish clifftops also have some lovely wildflowers in summer. You guide a photography workshop in the Cotswolds. What’s so special about the Cotswolds when it comes to flowers? The Cotswolds Lavender farm is one of my favourite places to spend time and to photograph because it has areas of mixed wildflowers, as well as the lavender. There are long rows of purple lavender, and also rows of other types of lavender, including pale mauves and pinks, which can give opportunities for great pattern pictures. You spend a lot of time in Europe too, including photography tours in the Netherlands. Do you consider the Netherlands’ tulips a classic for flower photography? Yes, I always love going to Keukenhof. They have thousands upon thousands of tulips everywhere. But I especially enjoy the tulips in some of the indoor displays, which are planted in the ground as they would be outside, but sheltered from any wind and rain. This means they are in tip-top condition, and the lack of movement enables some very enjoyable macro photography. You’re going to be leading a trip this summer to Wengen in Switzerland. What are the flowers and landscapes like there? We'll be visiting at the end of June, and all the alpine flowers should be at their peak; the meadows will be absolutely full of colour. This is all against the backdrop of the majestic Alps themselves, with beautiful pine woods and waterfalls to explore as well. Spending time among flowers must be a pretty calming way to live. What effect does it have on you? Photography in general is very calming and therapeutic once you become immersed in the subject in your viewfinder. There is nothing better than being out with my camera and surrounded by beautiful flowers, with their lovely colours and heavenly fragrance – and with a bit of luck, no sound but the humming of the bees. Photography in general is very calming and therapeutic once you become immersed in the subject in your viewfinder, and that applies times ten to flowers.